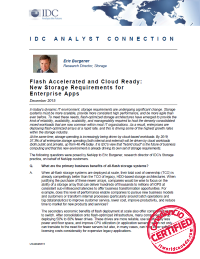 This insightful Q&A report with Eric Burgener, research director of IDC's Storage practice, looks at the benefits of all-flash storage, best workloads for flash storage, and when, why and how to best leverage flash-optimized storage arrays. In today’s dynamic IT environment, storage requirements are undergoing significant change. Storage systems must be more scalable, provide more consistent high performance, and be more agile than ever before. To meet these needs, flash-optimized storage architectures have emerged to provide the kind of reliability, availability, scalability, and manageability required to host the densely consolidated mixed workloads that are now common within most IT organizations. As a result, enterprises are deploying flash-optimized arrays at a rapid rate, and this is driving some of the highest growth rates within the storage industry. At the same time, storage spending is increasingly being driven by cloud-based workloads. By 2019, 57.3% of all enterprise storage spending (both internal and external) will be driven by cloud workloads (both public and private), up from 46.4% today. It is IDC’s view that “hybrid cloud” is the future of business computing and that this new environment is already driving its own set of storage requirements.